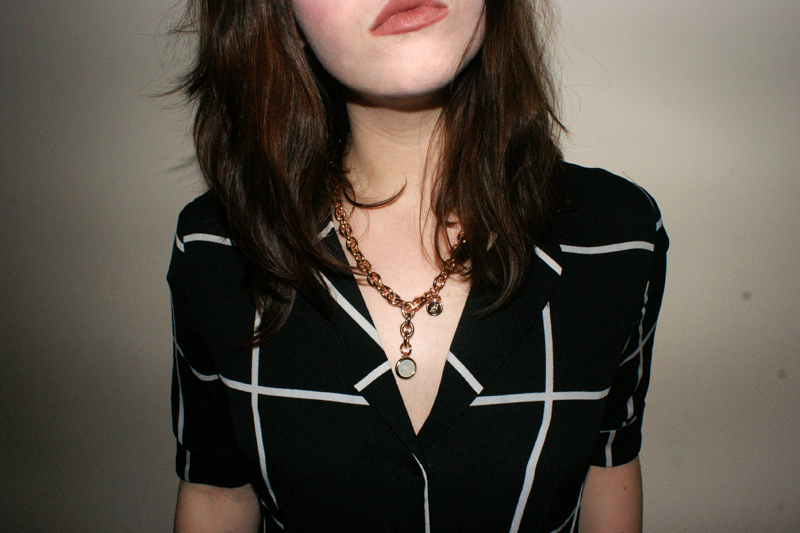 A jewellery-based post for you. With Mother's Day coming up, it's the perfect opportunity to give (or receive!) something special. I was lucky enough to get a closer look at a beautiful piece of jewellery from the 'Bronzallure' collection available at Chisholm Hunter, a UK jewellers with heritage dating back to 1857 - they've got a store in Manchester too! This rose gold plated necklace is made from a unique bronze alloy metal, plunged into 18ct rose gold and finished a aqua-coloured chalcedony semi precious stone charm. 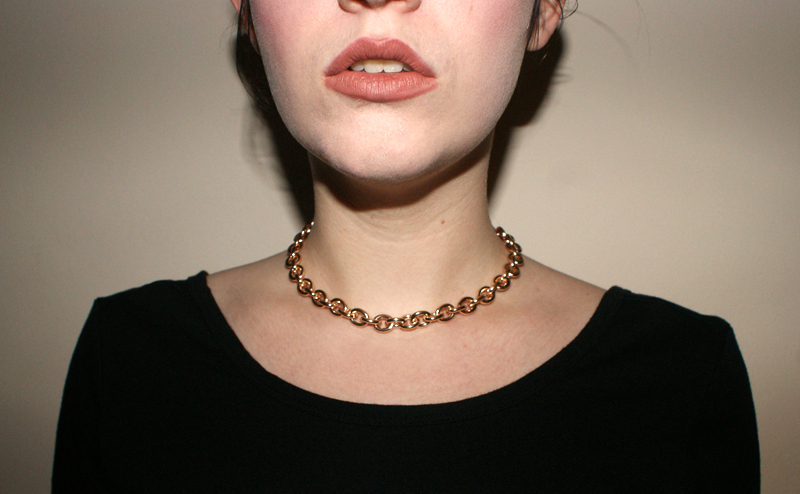 I'm definitely not one for dainty jewellery so I absolutely love how chunky the rolo chain is. Despite its thickness, the necklace is surprisingly light due to the alloy base metal. My favourite feature of this necklace is the unusual fastening. While a typical necklace closes at the back, the large lobster clasp on this pendant is designed to be worn at the front. I love how you can adjust it so that the stone hangs lower on your neckline. I had the idea that the necklace would look great fastened tighter and put on backwards so that it was almost like a choker chain from the front, but with the lovely aqua stone hanging down the back. I've paired it with a low-back crop top below but I think it would look gorgeous with a backless or cut-out back evening dress. The Bronzallure collection is new to Chisholm Hunter for Mother's Day. The range is inspired by classic Italian design and given a modern twist with stones like topaz, quartz and amethyst. You can view a great selection of Mother's Day gift ideas on their site, here - which includes well-known brands like Michael Kors and Thomas Sabo. My readers can also receive 10% off site-wide by entering 'BLOG10' at the checkout! On another note, I can't get enough of MAC's Velvet Teddy lipstick which I'm wearing in the photos above. I know it's not exactly groundbreaking news anymore and I'm not usually one to buy into celebrity makeup trends but I actually seriously adore this shade and I never would have chosen it without its huge rep! Not wanting to splash out on a MAC lip liner as well, I've paired it with a Maybelline liner I picked up which I think works really well - it's called 'Velvet Beige' from the 'Color Sensational' (cringing at having to write the American spelling) range. I also can't wait to blog the playsuit I'm wearing in the top photos - I recently bought it from Boohoo after spotting a presenter on MTV wearing the White version and tracked it down! I'm going to Amsterdam for a few days towards the end of next week and will hopefully get some outfit shots in to share once I come back. Are you looking forward to treating your mum (or being a treated mum) this Mother's Day? That top is so pretty.I really like the aqua stone. Its so dainty. precisely I'm looking for. Does one offer guest writers to write content for you personally?